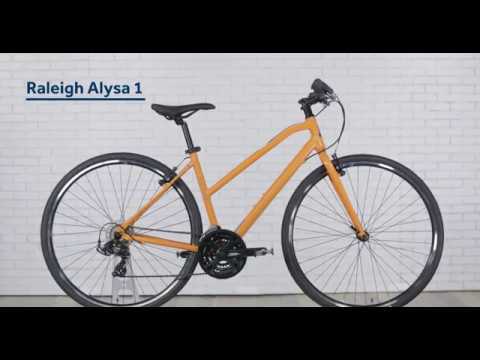 Get fit, go fast, and have fun on the Alysa 1— women’s flat bar, 21-speed step-thru fitness bike. Choose Size XS / Rider Height: 5’1" - 5’3" SM / Rider Height: 5'3" - 5'5" MD / Rider Height: 5'5" - 5'7" LG/Rider Height: 5’7" – 5’10"
If you love the idea of a lightweight, nimble road bike but prefer the sturdy, stable handling and upright position of a mountain bike, the Alysa 1 is for you. This step-thru, flat bar women’s fitness bike is made to put in miles along the bike path, ride through the city on your way to work, and go everywhere in between. The 700c wheels keep the ride quick and efficient while flat handlebars and sporty geometry make it stable and comfortable.